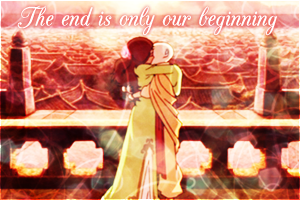 The Legend of Korra won the 2013 Daytime Emmy for Outstanding Casting for an Animated Series or Special. 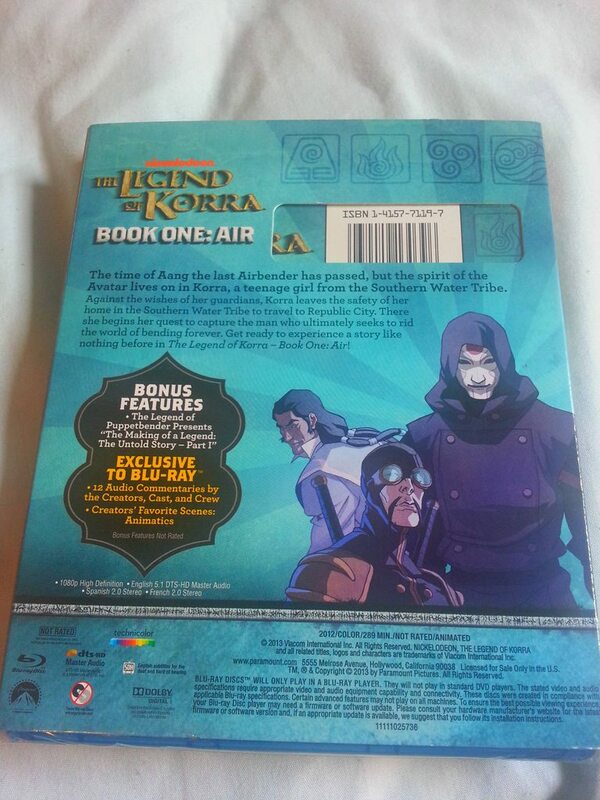 Apparently the Lok Book 1 Bluray got shipped early for some consumers. The Legend of Korra panel will be held on Friday, July 18th from 11:15am-12:15pm in Ballroom 20. THR also reveals that Nickelodeon is releasing an interactive book, The Legend of Korra: Enhanced Experience, on July 2nd, which includes concept art, an in-depth look at the characters, animatics, storyboards and more. Apparently The Legend of Korra Book 2 will air in Canada in the fall. An article that provides insight into Tonraqu and Unalaqu and the conflict between them, info that appears in the iBook that will be made available tomorrow. IGN got sneak peeks of the "The Legend of Korra: Enhanced Experience". Comic Con just updated their site with this year's Korra panel description! I am not obsessed with Avatar. I am in love with it. The Legend of Korra has added several familiar names to its cast for Book 2: Aubrey Plaza, Lisa Edelstein and James Remar are among those voicing characters on Nickelodeon’s animated action-adventure series, EW has learned. 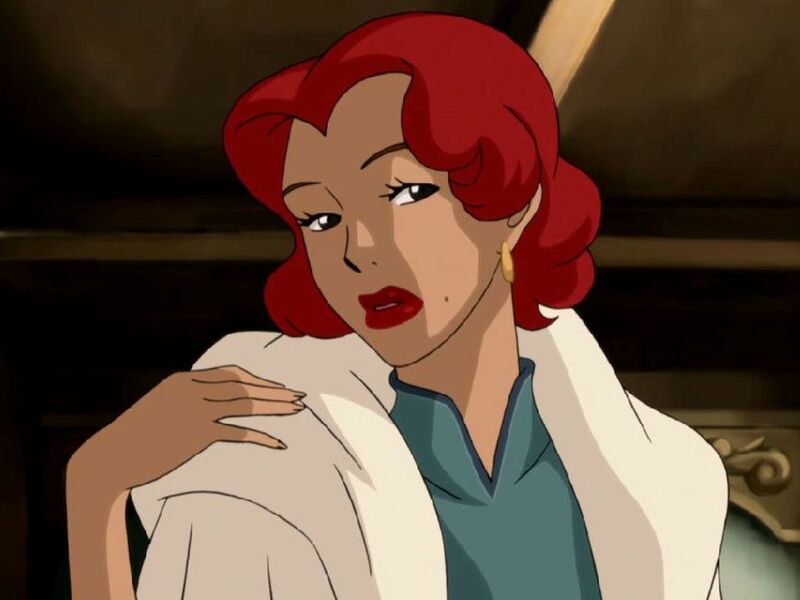 Plaza (Parks and Recreation) will play Eska, who is one of Korra’s Waterbending cousins, and whose twin brother, Desna, will be voiced by Joan of Arcadia‘s Aaron Himelstein. (Check them out in the image above, which was taken from an upcoming episode.) Remar (Dexter) will assume the role of Tonraq, the powerful Waterbender who is Korra’s father (and is pictured below), while Edelstein (House) will play Kya, Tenzin’s sweet-yet-impatient sister. In addition, John Michael Higgins (Best in Show) has been cast as Varrick, an eccentric capitalist and self-proclaimed “Biz-Bender,” while Adrian LaTourelle (Sons of Anarchy) will tackle the role of Unalaq, Korra’s uncle and Chief of the Northern and Southern Water Tribes, who seeks assistance from Korra. Book 2 — a.k.a. 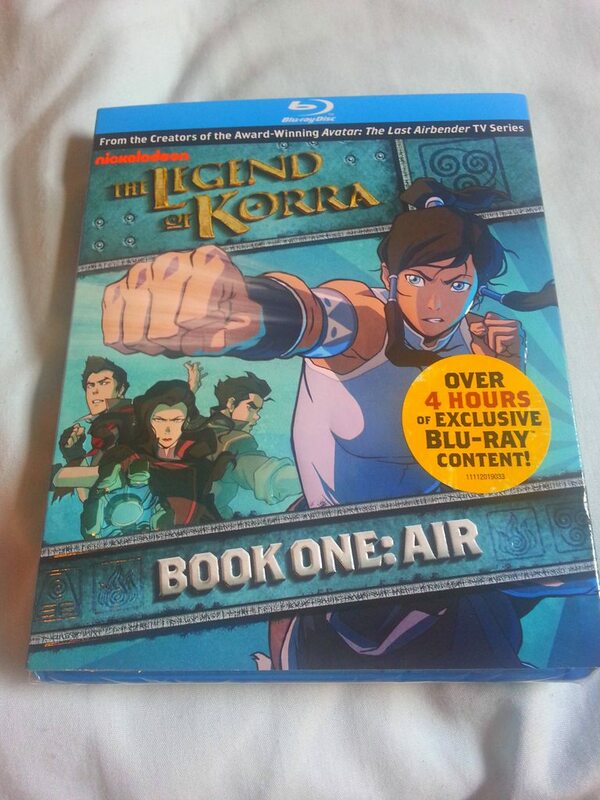 the second half of season 1 — picks up six months after Book 1 ended with Korra triumphing over Amon and the Equalists. Now she faces an even greater threat “as the physical and spirit worlds collide.” Consisting of 14 episodes, Book 2 will debut later this year. 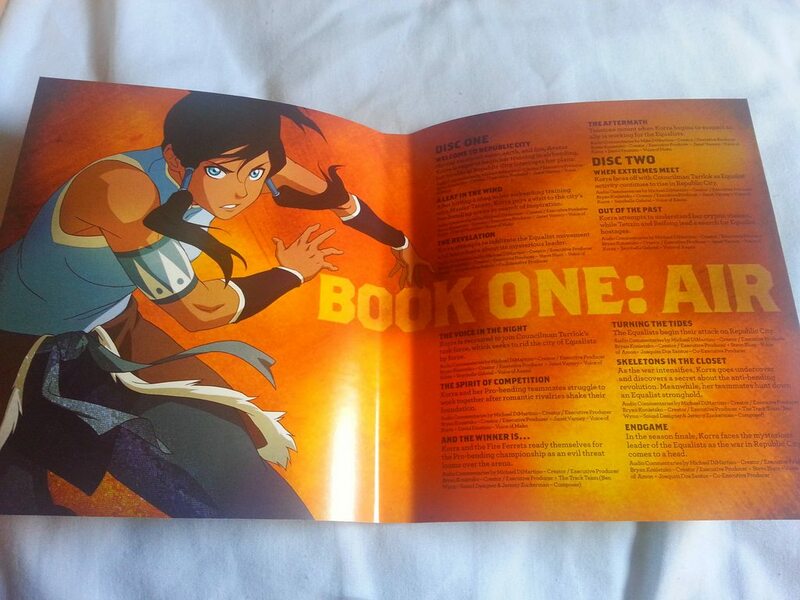 The first episode of Season Two will be shown at the Legend of Korra SDCC panel. No news if they will ban the recording of the episode or not, or if they will release the episode to the general public online shortly after. Steven Yeun will voice Wan, the first Avatar, whose quest to bring peace between humans and spirits takes place ten thousand years before Korra's time. Wan's story will be told in two episodes in the middle of Book 2, called "Beginnings 1 & 2." Give me a bullet and I'll change your life"
An upcoming series on Nick.com about the origins of several of the characters. The first one is about Mako and Bolin growing up on the streets, called Hustle or Be Hustled. Youtube link to all users that don't live in the USA. 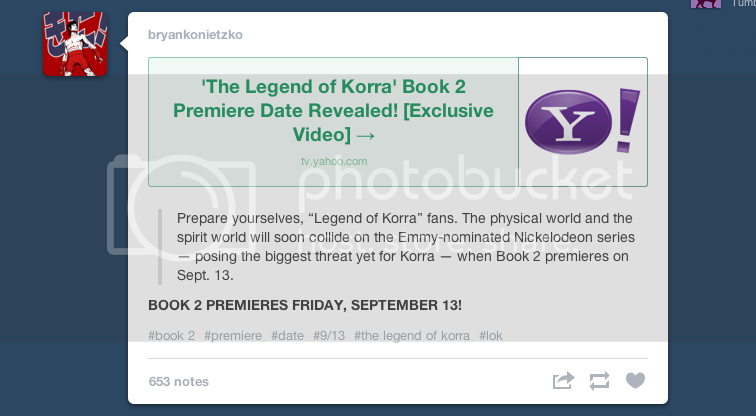 According to Bryan's tumblr, the premiere date is ACTUALLY September 13th. I'll have the screenshot in a second. AND A NEW TRAILER to go along with it! Nickelodeon has put up what seems to be a final trailer for Book 2 before the Friday premiere. It's EPIC. I'll update this post with a Youtube link when one becomes available. Hubba Hubba! This red haired vixen is appropriately named Ginger, but watch out-- she's a total heartbreaker. New interview that EW put together. It's official: TLoK is moving time slots. Now it's on at 8:30pm EST / 7:30pm CST, Friday nights. New clip is up on Nick. This one is about Bolin at the movies. 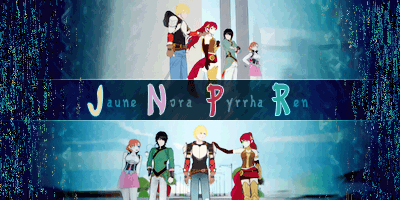 Book 3 Title has been announced! New interview with Mike and Bryan on the Book 2 finale. Also reveals that Book 3 will start a few weeks after Book 2 ends (in-universe, I mean).